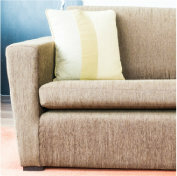 Mold can form on virtually every type of household surface including wood, fabric, and upholstery. 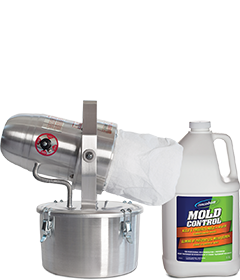 Treat your belongings with Concrobium Mold Control – to kill and prevent mold and mildew with no bleach or toxic chemicals. Spray Concrobium on the affected moldy surface and allow to dry. 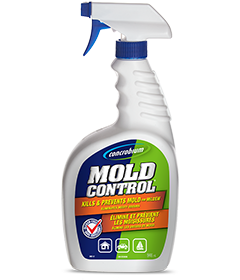 As it dries, Concrobium crushes the mold spores to kill the existing mold. Next, with a Concrobium dampened brush or cloth, wipe away the remaining mold residue, leaving behind a thin layer of the product to prevent from future mold growth. Any residue remaining on the furniture or upholstery is non-toxic, and completely safe for your family to be in contact with. NOTE: The solution is colourless and won’t affect appearance, but will resist mold growth by preventing mold spores from attaching to the surface. If you are concerned about the impact on the appearance of your fabric, please start by testing in an inconspicuous section.